CRM (Customer Relationship Management) is the latest software application developed by Quipu to support banks and other financial institutions with the process of customer relationship management. The application is based on Microsoft Dynamics CRM 2016. The initial intention was to develop CRM as a tool for managing business relationships with potential and existing small business clients. 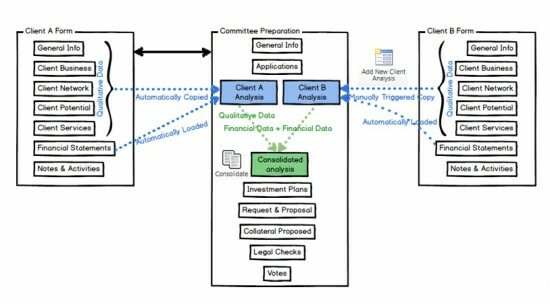 Its scope was then broadened to include financial analysis and credit risk analysis capabilities as additional support for the banks’ decision-making processes. Client data and financial data are all stored in one place in chronological order. These data can be accessed at any time to obtain an overview and to monitor the development of the client’s relationship with the bank, as well as the client’s financial situation. Client data and financial data registered in CRM are accessible by all parties involved in the advisory process, making CRM a single hub for client related institutional communication. All data is stored, all information is accessible (on a need to know basis), all activities are recorded. 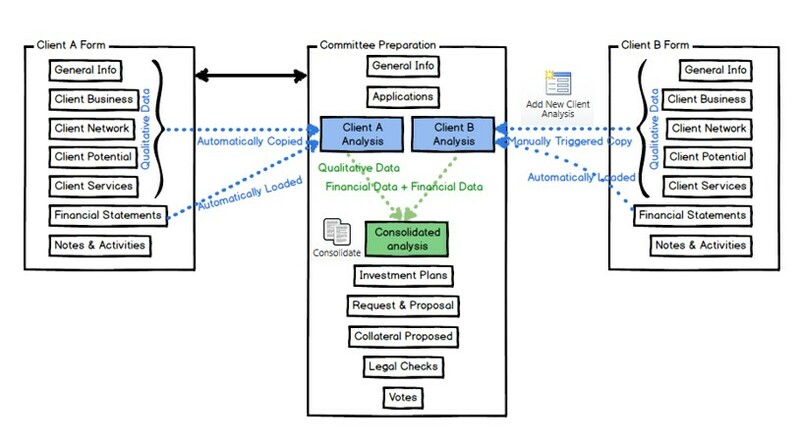 Business Committee Preparation is a new concept in CRM Version 3.0 designed to support the decision-making process with respect to future co-operation with an existing or potential client. Business committees without risk classification, where a strategic decision is taken on the list of products and/or services which could appropriately be offered to a client. Business committees with risk classification, where the decision is taken whether to approve, modify or renew a credit limit for a client. In this case, a financial analysis is also performed. The Committee Preparation process flow is well defined, ensuring all of the steps involved in the preparation phase, i.e. data entry, assessment, proposal and voting, have been completed satisfactorily and in a timely manner. The same form is used by all parties involved in the decision-making process. The process is arranged so that after finishing the part they are responsible for; the form is then assigned to the individual responsible for the next step of the process until all of the required steps have been completed. qualitative information about the client’s business, e.g. the historical and current situation of the business, along with future plans for development. quantitative information about the client’s financials, e.g. financial statements and other financial reports. Business Report supports banks when they are analysing a client’s current and past relationship with the bank, assessing the business potential of the client and related parties, and analysing the client’s activity with the bank. Full Version of the Business Report contains data from the client and the Committee Preparation form, including financial data and the full risk assessment. Short Version of the Business Report provides a brief overview of the client’s data and performance. Risk Classification Report reflects the assessments carried out by the analyst responsible for the client and by the credit risk officer, including all fields of the Committee Preparation form which have an impact on the risk classification and the final risk values. Back Office Report contains and provides the back office with all data to be registered in the core banking system. These reports include very detailed data from the core banking system as well as CRM, enabling users to retrieve all available information from one place. While all the actions and functions included in the description above are covered by the new version of CRM Version 3.0, the software modules and the data entry fields provide for a high degree of customisation, corresponding to the individual requirements of our customers.